We’ve spoken a lot in this blog about how to enhance your presence on social media by experimenting with new trends, using engaging content and targeting the right audience – but we haven’t focused as much on a vital question; how do you know if it’s working? This is where analytics come in; the hard numbers that tell you how many people you reached and engaged with. 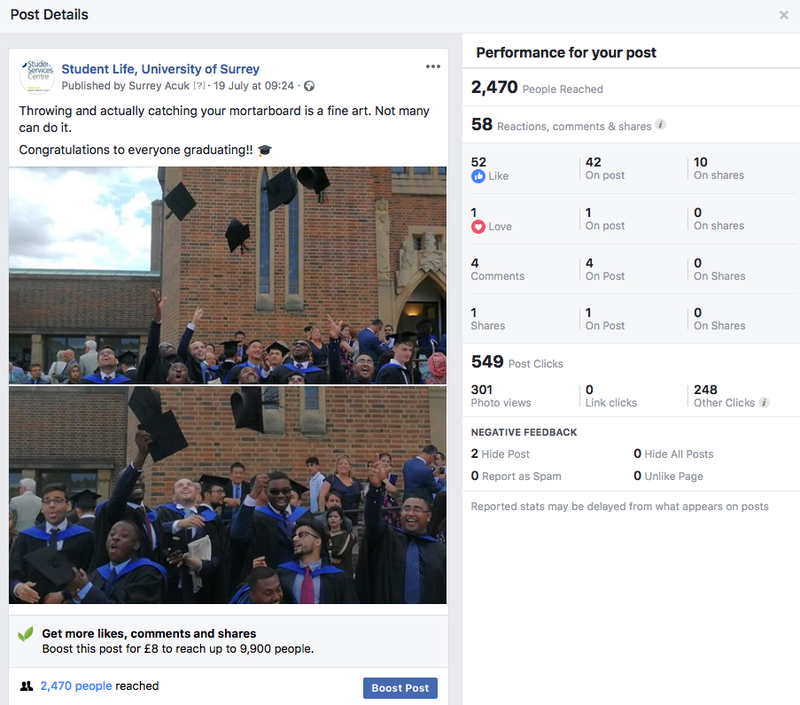 For our central and student-facing channels, we use a variety of tools to gather and analyse these stats, but some of the most useful are the in-house analytic sections of each platform. Here, we’ll go through how to gather stats from the major platforms, then look at other useful tools before finally discussing how to use these stats. Impressions are the amount of times users saw the tweet on Twitter and engagements are the amount of times users actively engaged with the tweet – including clicks anywhere on the tweet, retweets, likes, follows and replies. This is an overview of the figures from your account from the past 28 days, with a comparison against the 28 days previous to that (shown by the percentages next to each figure). Also, side note; you’ll notice in that image that we lost a lot of followers in this period, that’s because Twitter purged the platform of bot accounts, so any accounts with large followings would have lost a fair few followers from that. Again, Twitter automatically shows you the stats from the past 28 days. The graph represents the impressions you had on Twitter each day in that period, and also shows how many tweets were sent each day. 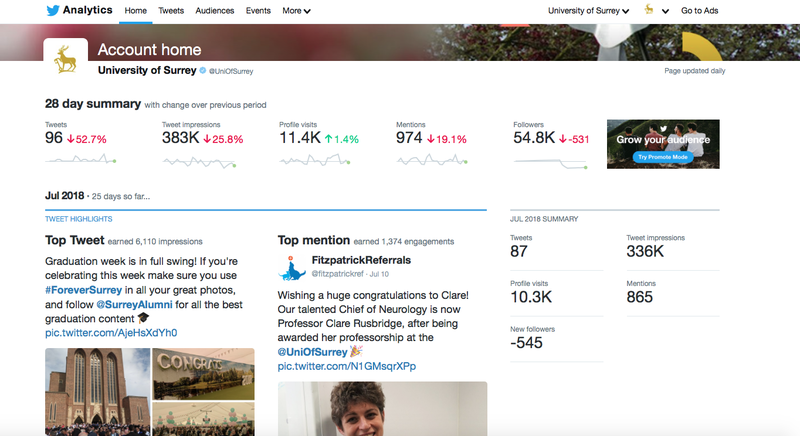 If you scroll down you’ll be able to see every tweet you sent in that time period and the impressions and engagement of each one. You’re not limited to seeing just the stats from the past 28 days though – you can set the time period you want to analyse. In the top right corner you’ll see a button that says ‘Last 28 days’ with a drop down arrow. Click on this, and you’ll then be able to customise the timeframe you get stats from, and the dashboard will change accordingly. If you want to go into more detail (which we always do), then you need to export the analytics data. Once you’ve selected the time period you want stats for, hit the ‘Export Data’ button in the top right corner. All of these stats will then be added to an Excel document, which should automatically start downloading. 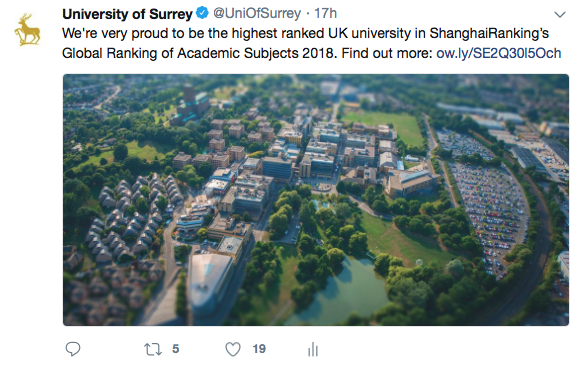 One of the key advantages of looking at this detailed breakdown is seeing how your users are engaging with your posts; are they retweeting, liking, replying etc. You can also use the Excel Formulas to calculate total impressions, engagement, retweets, likes etc. and also the averages for these categories. We gather the total and average figures for each month, and compare those numbers to previous months. So, that’s how you gather the data for a certain time period, but if you only want the stats for a handful of tweets, or even just one, then you won’t need to go into Twitter Analytics. If you hover your cursor over each type of engagement, you’ll be shown a short description of what that engagement means if you’re unsure. Like Twitter, Facebook also has its own analytics section, though they call it Insights (note: this is only available to Pages, not personal profiles). When you’re on your page, click the Insights tab at the top. 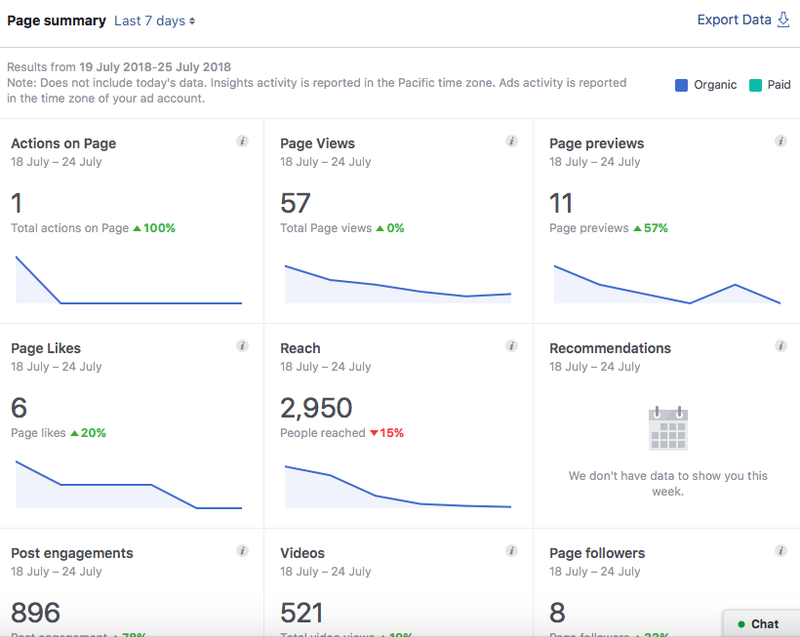 You’ll be given a summary of the key stats for your page; Facebook automatically pulls it from the last 7 days, though you can change this to ‘Today’, ‘Yesterday’ or ‘Last 28 Days’ as well. Again, you’ll also see comparison percentages against the previous timeframe (e.g. if you’re looking at 7 days, it compares the stats against the previous 7 days before that). On the left hand side you’ll see various options, each of which will present you with graphs and stats – you can also adjust the date range in the top right corner. If you click on ‘Posts’ you’ll be able to look at all the posts from your Page, and their reach and engagement. 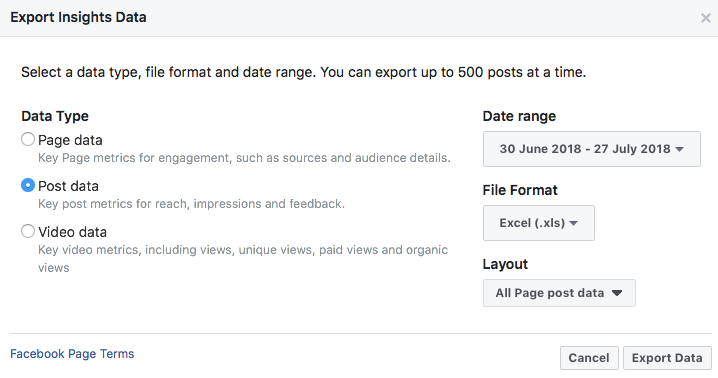 Facebook also allows you to export a detailed account of your data. Go to ‘Overview’ and in the top right corner, click ‘Export Data’. You can then select the date range and download it into an excel file. 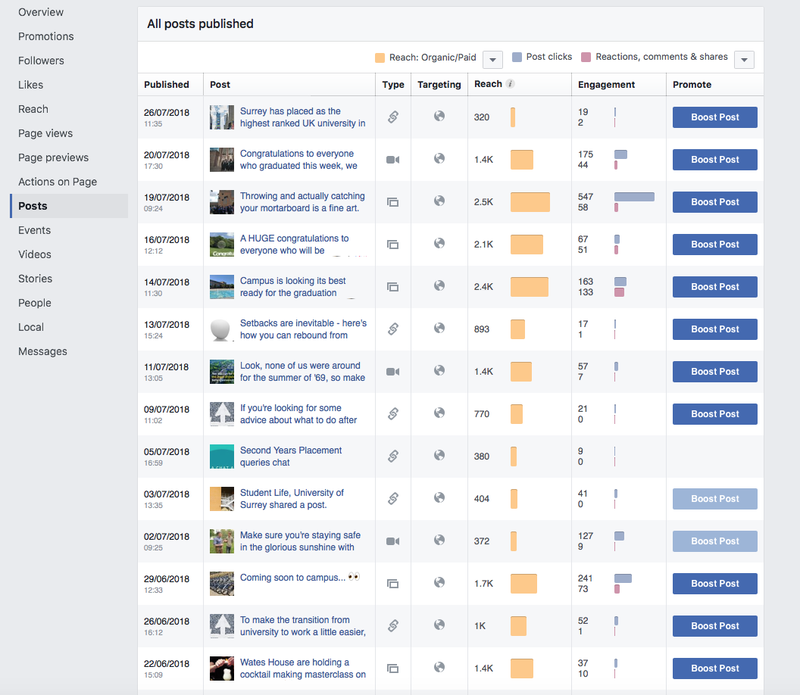 To get all the information of the reach and engagement of all your posts in that date range, select Post Data, as shown in the picture above. You’ll also find that in the excel sheet, Facebook includes a brief description of each metric, so you know exactly what the stats mean. Alternatively, you can go back to the Posts tab in Insights, and find the post there. As things stand, only verified accounts and ones that receive high levels of engagement are able to access the Insights feature on Instagram, and even then it’s only available on the app – you can’t access it through a computer. So, the main things to focus on are Likes, Comments, Follows (and video views when applicable). These are all easy to find and track, so there’s no need to go into detail here. We’ve also spoken about Instagram Stories in a previous blog post. This is where you properly discover if you’re social media output is working, but to first determine that, you need to be clear on what your goal and purpose is for it. It might be to drive traffic – in which case link clicks would be very important – or it might be to raise awareness, for which you’d look at your total reach. So, once you know what you want out of your social media presence, you can then start measuring your statistics against those goals. Total engagement and reach are stats that you’ll always be interested in, though it’s up to you how often you measure them – as mentioned above, we do this monthly. Whatever timeframe you choose, make sure you track these figures when you need to, and collate them in the same place so that you can compare. It’s also worth taking note of the top performing and worst performing posts in that time frame. Do either of them have any trends, or similarities? It may be that certain types of content are working well (or not so well). Contextualising your data is also vital. You’ll need to consider what was going on during the time frame you’re looking at; were you running any campaigns, or any big events that you covered on social? Was it a time of year when your audience won’t be as engage with your content? 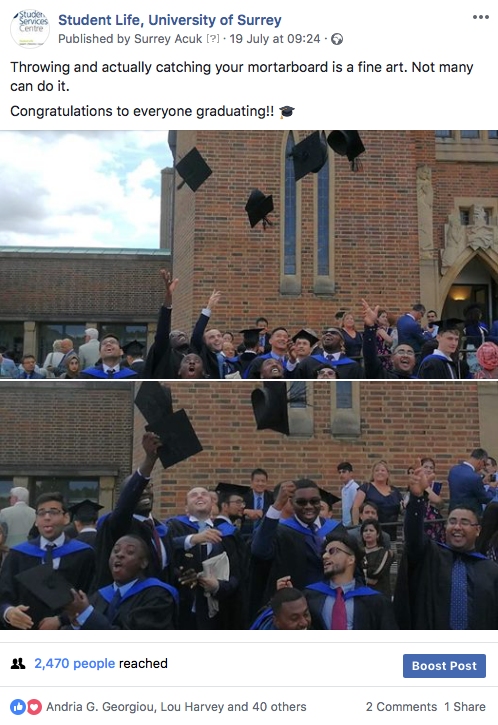 For example, on our student-facing channels, there’s not much point in sharing campus updates at the moment as most students aren’t around over the summer. 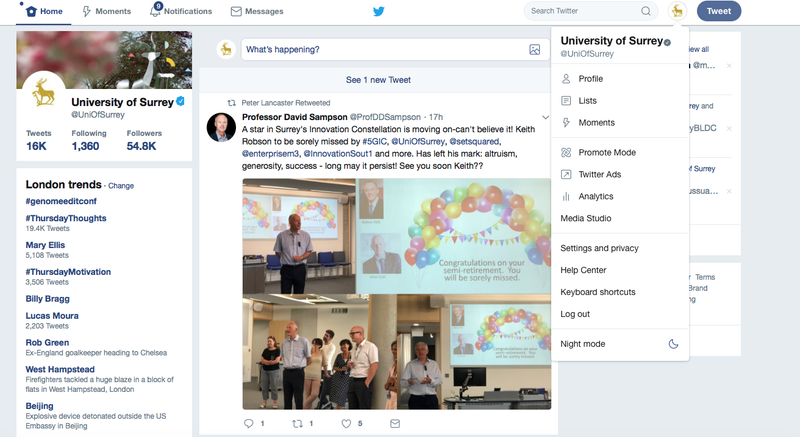 If you can, try to also note what time of day your best/worst performing tweets are going out – this will give you a much better idea of when your audience is online. Analytics are the best way to make sure you’re social media output is working – how you use them is up to you though!